An Italian classic recipe for March 8th: the sponge cake recalling the flower, to be served on the Apollo doily lace patented by Novacart. 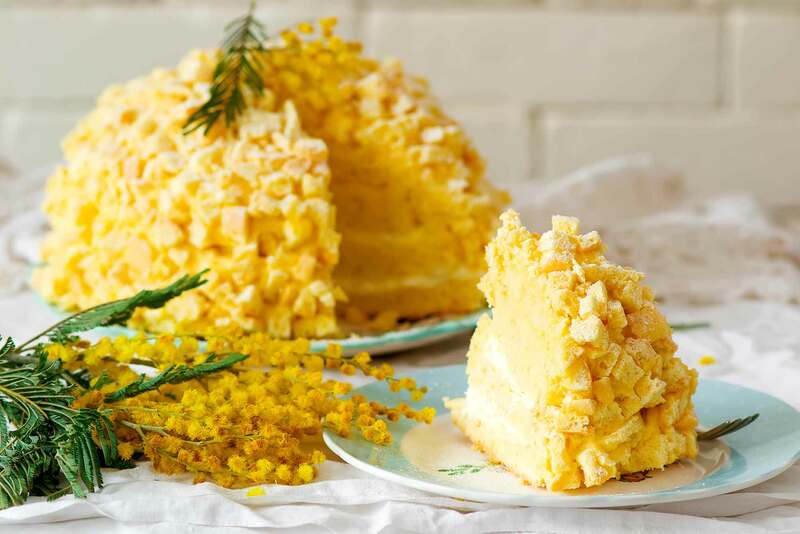 The Mimosa cake is a great Italian classic to be put on the table on March 8th, International Women's Day. Whether it is for your mother, daughter, wife or colleague, this dessert recalling the small yellow flower will surely be a welcome surprise. Prepare the sponge cake, that will serve both for the base and for the decoration. Pour the eggs into a bowl with 9 oz of sugar and mix. Add 5 oz of sifted flour and a sachet of vanillin. Melt the amalgam. Butter a pan with high sides, about 25 cm in diameter, and sprinkle with flour. Bake it with the dough at 180 degrees for half an hour. Once ready, take it out of the oven and leave it to cool. While the sponge cake is cooking, prepare the filling. Mix four egg yolks with five teaspoons of sugar in a saucepan. Add 1.5 oz of flour and a pinch of vanillin. Heat 14 oz of milk and, once it has almost completely boiled, pour it a little at a time onto the mixture, while whisking. Put the saucepan on the stove and mix with a wooden spoon until the mixture thickens. At this point, remove it from the heat and let it cool. In the meantime, add 9 oz of fresh cream to mix with the custard. Now prepare the liquor syrup, dissolving two tablespoons of sugar and 7 oz of water in a saucepan, along with two tablespoons of Grand Marnier liqueur. At this point, you can compose the cake. Cut the sponge cake horizontally across the top. Empty the base slowly and keep aside the crumb, which will serve for the final decoration of the cake. Then spoon the liquor in the sponge cake. Then fill the base with custard, leaving aside a little. Close the cake with the sponge cake cap, after brushing it with the liqueur. Cover the cake with the custard left and decorate freely with the sponge cake. Leave the Mimosa cake in the fridge for about an hour before serving. The Apollo 6 doily lace patented by Novacart is made of cardboard coupled with Pet gold film and is ideal for the presentation of the Mimosa cake. The Apollo 6 lace has a diameter of 300 mm, is resistant to food fats and oils and is recyclable. The elegant design makes it perfect for presenting cakes and other desserts.